Just for fun one year, I Googled Dr Seuss Birthday on March 2nd just to see what I could learn about him. 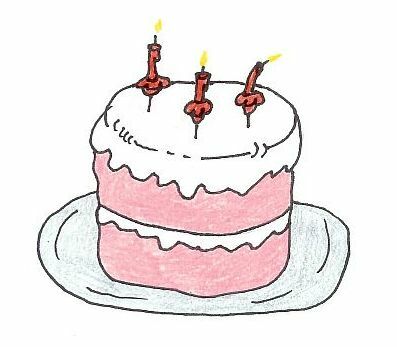 I was so fascinated with what I read that I decided to build a web page about it to share with you. There Are Many Fun Things To Do With Kids To Celebrate Dr Seuss Birthday. When I started sharing Dr. Seuss facts and books with my daycare kids, they too became very fascinated with everything. We had a lot of fun throughout the whole week! Dr. Seuss was born Theodor Seuss Geisel on March 2, 1904 and died on September 24, 1991. When Theodor was in college, he and nine of his friends were caught drinking gin in their dorm room during prohibition. One of their punishments was having to quit all extra-curricular activity which included the college magazine where Theodor was a cartoonist. He continued drawing cartoons, but to avoid getting in trouble, he came up with Seuss as his pen name. Seuss was his mother's maiden name. He added the Dr. in front of Seuss after college. Dr. Seuss was never a doctor. He planned on getting his PhD in English literature, but met a woman and got married and moved to the United States never to return to school. Seuss never intended to become a children's author, but because of his contract with Standard Oil as their ad campaign illustrator, he was prohibited from writing many different things. But not childrens' books. March 2nd (Dr Seuss birthday) has been adopted as National Read Across America Day because of Dr Seuss' dedication to improving children's literacy. 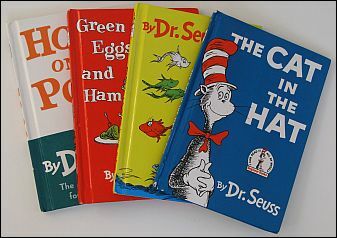 Dr. Seuss had 60 book published over his lifetime with 44 of those books being children's books. There have been approximately 222 million copies of Dr. Seuss' books sold. Dr. Seuss' books have been translated into 15 different languages. Seuss' first book was rejected 27 times before an old friend who had become a publisher picked it up and published it for him. Seuss was also a political cartoonist for a New York City newspaper. Many of his children's books had political innuendos. Seuss and his first wife were unable to have children. Tired of his friends bragging of their children, Seuss came up with an imaginary daughter named Chrysanthemum Pearl. He dedicated one of his books to her and signed her name on Christmas cards. One year, he made up several children to include on his Christmas card. He invited the neighbor kids over to have their picture taken to use in his Christmas card. He was frequently asked how he could write such good books for children when he had no children of his own. He came up with a stock answer of "You make 'em, I'll amuse 'em." In the 1950's, there was big concern about children's illiteracy. An executive at Houghton Mifflin came up with a list of 348 words that he felt were important for all first graders to be able to recognize. He challenged Seuss to write a book that children would want to read using only 225 of those words. He wrote "The Cat in the Hat" using 236 words. A couple years later, a different publisher challenged him to write a book using only 50 words. He wrote Green Eggs and Ham. Universal's Islands of Adventure in Orlando, Florida has a section in their park called Seuss Landing. The island was designed around Seuss' illustrations in his book by using no straight lines. The palm trees follow the theme of no straight lines because they are bent from Hurricane Andrew. Return to the top of Dr Seuss Birthday. One of Dr. Seuss' most popular books is Cat in the Hat. 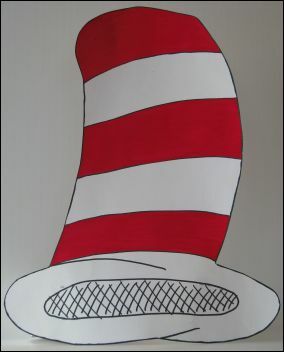 Celebrate Dr Seuss birthday by making this famous red and white stovepipe hat. The kids will love making them and love wearing them! Using the photo as a guide, draw a pencil etching of a stovepipe hat on a piece of tag board that is approximately fifteen inches high and the brim being ten inches wide. Copy over the etching with the sharpie marker. Cut the hat out. Using the red tempera paint, paint the stripes on the hat. Cut a strip from the tag board measuring 3" x 18". Staple one end to the back side of the brim. Measure the band around the child's head and then cut and staple to fit. So fun to make and so fun to play with afterwards! Print the Thing 1 and Thing 2 template. Cut out the pieces. 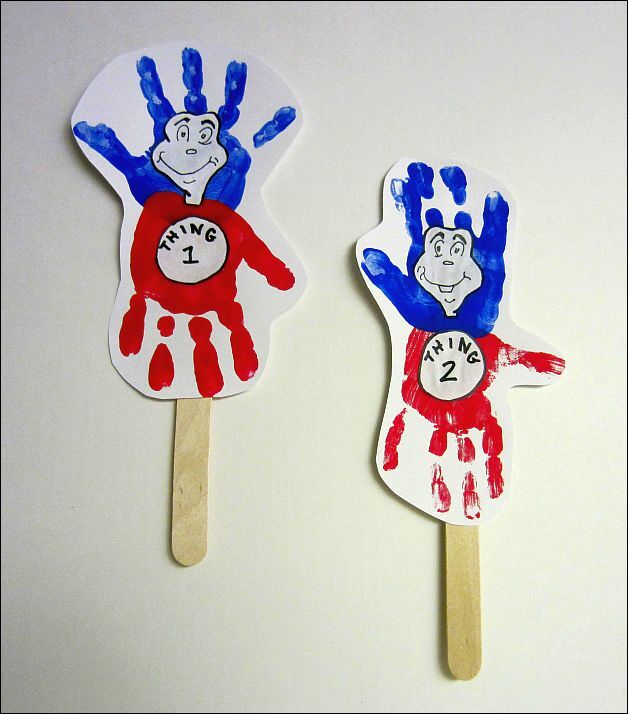 Paint the child's hand with blue paint and make a handprint on the cardstock paper. Let dry. Repeat the procedure with the red paint. Let dry. Glue the template pieces onto the handprints. Let dry and then cut out. Use the masking tape to tape the tongue depressors onto the back of the stick puppet. One Fish, Two Fish, Red Fish, Blue Fish! Another Dr. Seuss classic. We read the book and then made these adorable handprint fish bowls. Print the fish bowl stencil on white cardstock paper. 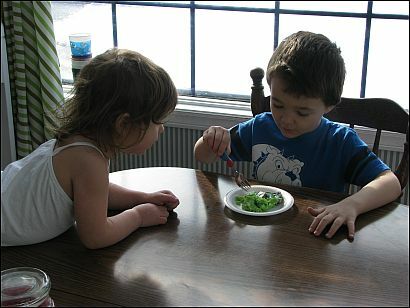 Have the kids paint the water in the bowl with blue water color paint. Let dry. 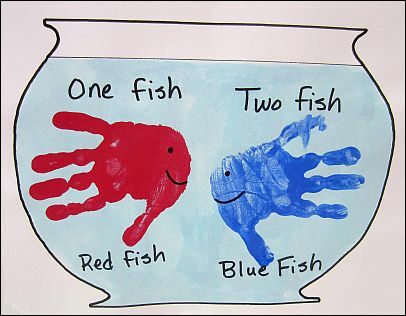 Paint the child's right hand with red tempera paint and make a print on the left hand side of the fish bowl. Let dry. Paint the child's left hand with blue tempera paint and make a print on the right side of the fish bowl. Let dry. Use a black sharpie to make the faces and to print the words. The Lorax is a grumpy but charming creature featured in a classic Dr. Seuss book and in the 2012 movie called by the same name. 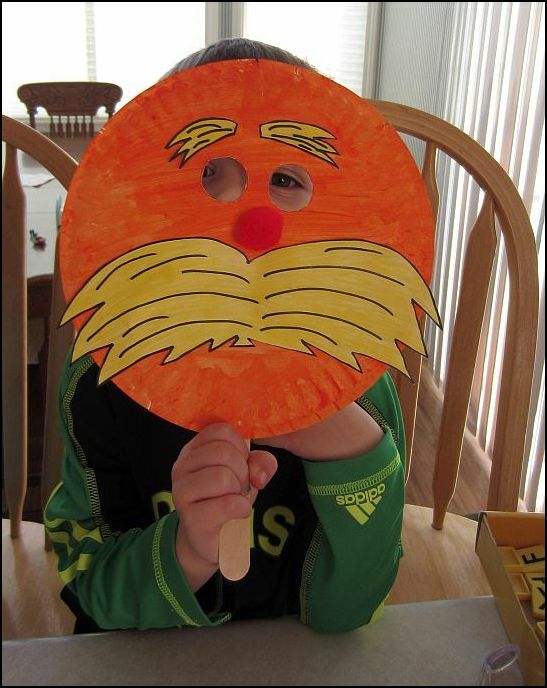 Print "The Lorax" mask stencil on white cardstock paper. Paint the paper plate orange. Let dry. Color the pieces of the template yellow. Cut out each piece. Use the circle piece to draw the eyes of the mask and then cut out the eyes. Glue on the mustache, eyebrows and pom pom for the nose. Let dry. Attach the tongue depressor with duct tape to the back. Let the kids play with them and enjoy! Start out Dr Seuss birthday with some green eggs and ham! Prepare the ham the night before by placing the slices into a ziplock bag. Marinate the ham with 1/4 cup of water and several drops of green food coloring. Crack the eggs into a bowl and scramble. 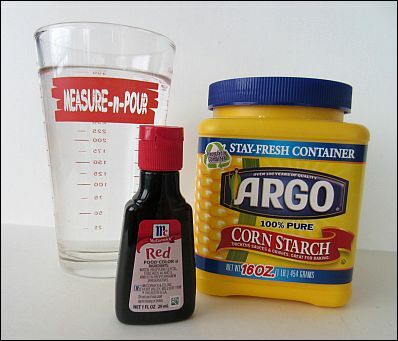 Mix in several drops of green food coloring. Spray a frying pan with cooking spray or melt the butter in the frying pan and cook the eggs. Serve immediately. There are 44 Dr. Seuss childrens' books to choose from! The most popular titles are Green Eggs and Ham, Cat in Hat, One Fish Two Fish Red Fish Blue Fish and Hop on Pop, but there are many, many more to choose from. Sit down and read a story or two to the kids today! 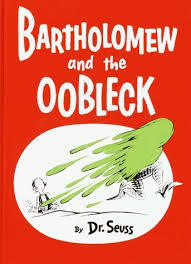 From the Dr. Seuss book Bartholomew and the Oobleck you can make your own oobleck for the kids to play with. It is a very strange substance that makes lots of fun! Mix the ingredients thoroughly and pour into an 8x10 cake pan. Let the kids play. 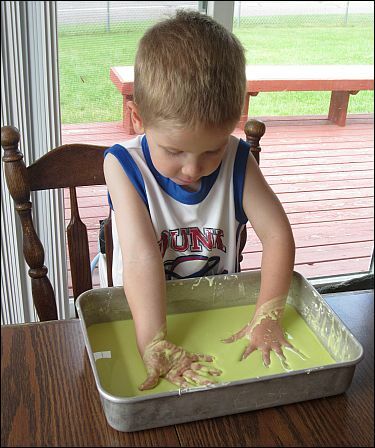 Show them the difference between laying your hand flat and "slapping" the oobleck, compared to slowly lowering your hand into the oobleck. Is it a liquid or is it a solid?